The first thing any homeowner has to consider when choosing curtains, is whether they should choose custom made curtains or off-the-shelf curtains. The benefits of custom made curtains means you can tailor them to your exact specifications – fabric, colour, trimming, length, lining and the finish. If you fancy adding a swag in a complementary colour to make the window a focal point of the room, it is easy to do. The benefit of an off-the-shelf option means it is more inexpensive, you have more room to spend on additional soft furnishings to bring the whole room together, if budget is an issue. Before you even think about curtain shopping or commissioning a custom made pair, take out your tape measure and get your exact dimensions right. There is nothing worse than ill-fitting drapes to ruin the look of an interior. Decide how high above your window you would like your curtains to begin. Designers often hang curtains approximately 15 centimetres above the window frame. If you want to add more drama, consider hanging them higher. Measure from the top of the window plus add the extra centimetres where the curtains will actually hang from (15 centimetres or more) to the floor. If you want a modern look, measure just to the floor. For a traditional look, add an extra 5 to 8 centimetres so the curtains gather on the floor. To measure the width of your window, add 10 to 20 centimetres on both sides and double the total number so that your curtains will look full enough when hanging. If blocking out light is a priority for you, extra centimetres around the perimeter of the window frame will help block it out. 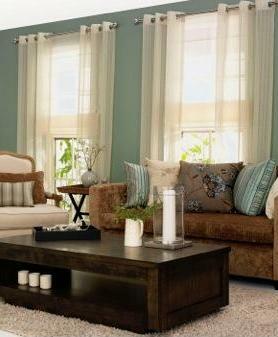 Your choice of fabric is key to the longevity of your curtains. Getting it right means your curtains will hold up over time. Getting it wrong means you will be replacing them more often than you would like. Choosing curtains that are too heavy means they may not fall crisply enough when drawn. If they are too light, it means they may not fall well. Sunlight fades fabrics over time. If your room has lots of light flowing in, it is best to avoid choosing brightly coloured fabrics. Neutral colours are less likely to fade and blend in better with a room. Silk, faux silk, velvet and linen are good choices that tend to hang well. The majority of curtain fabric can be lined with a thick insulating felt material. Interlining is where a piece of fabric slipped between the lining and the main curtain fabric can also help increase the longevity of your curtains. Share the post "How to Choose the Right Curtains for Your Home"